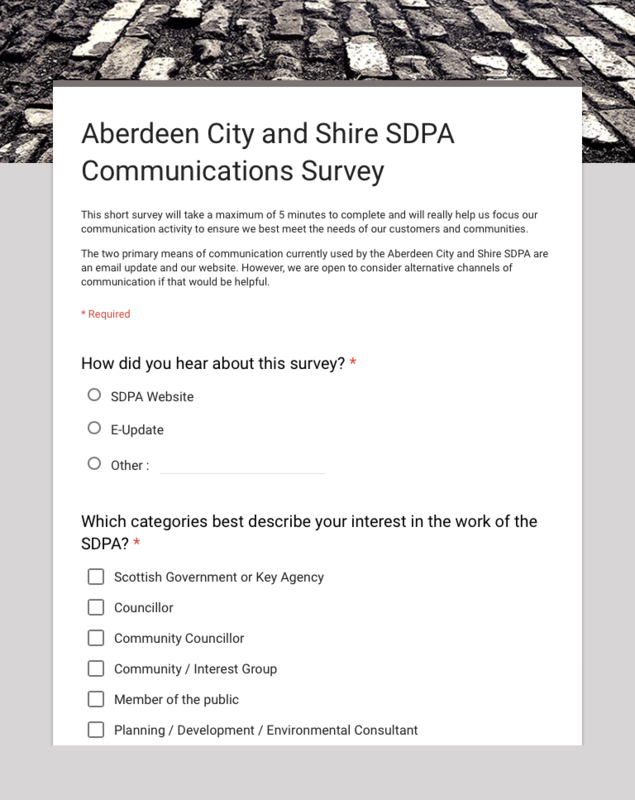 The SDPA has started the preparation of a replacement for the current Aberdeen City and Shire Strategic Development Plan which was approved by Scottish Ministers in March 2014. As part of this we are reviewing how we communicate with stakeholders, communities and the general public. A short online questionnaire has been prepared to enable you to contribute to this review - focusing on this website, our E-Updates and the potential use of social media (including Twitter and blogs for example). The questionnaire (below) will take just a couple of minutes to complete but will provide us with valuable information on how we can improve our services. Thank you for your interest in the work of the SDPA and please help us communicate with you better.